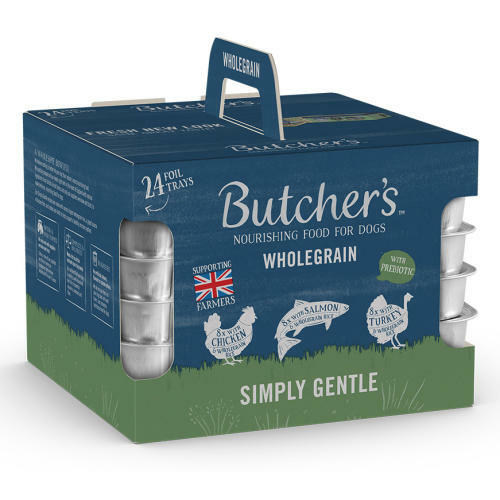 Butchers Simply Gentle Trays Wet Dog Food contains 3 mouthwateringly delicious flavours that are bursting with all the essential nutrients that dogs need to be at their best. The Simply Gentle recipes are made with easy to digest wholegrain rice, a great source of fibre and slow-release energy, and added prebiotics to help support a healthy immune system. They’re ideal for dogs with sensitive tummies. Chicory: This tasty plant contains inulin, a great source of dietary fibre that helps your dog’s digestion. Ingredients (Turkey & Rice): British & Irish Farmed (Chicken 27%, Beef 12%, Turkey 11%), Cooked Wholegrain Rice 10%, Salmon Oil, Sunflower Oil, Prebiotic (Mannan-oligosaccharide 0.2%), Chicory 0.1%, Parsley, Rosehip, Mint, Minerals. Ingredients (Salmon & Rice): British & Irish Farmed (Chicken 26%, Beef 12%, Salmon 12%), Cooked Wholegrain Rice 10%, Salmon Oil, Sunflower Oil, Prebiotic (Mannan-oligosaccharide 0.2%), Chicory 0.1%, Parsley, Rosehip, Mint, Minerals. Ingredients (Chicken & Rice): British & Irish Farmed (Chicken 38%, Beef 12%), Cooked Wholegrain Rice 10%, Salmon Oil, Sunflower Oil, Prebiotic (Mannan-oligosaccharide 0.2%), Chicory 0.1%, Parsley, Rosehip, Mint, Minerals. Analytical Constituents: Protein 9%, Crude Fibre 0.2%, Fat Content 5%, Crude Ash 2%, Moisture 83%.